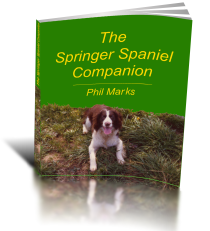 Springer Spaniels Rescue - What's It About? This is a large business – or more accurately a group of individual charities, worldwide, which specialise in springer spaniels rescue. That is, they take in springer spaniels, and look after them until a new owner is found, or until the dog has to be destroyed. When you multiply this up across all popular breeds, and add in the ‘all-breed’ rescue centers, then you see the scale of the unwanted dogs problem. Fortunately, today, fewer dogs are having to be destroyed as a result of lack of resources to keep them. After all they have to be fed (cost) and exercised (staff – sometimes volunteers). Then, occasionally, some require veterinary attention. Most dogs will need to be checked over on arrival, and sometimes calling a veterinarian in would be necessary – and that could result in destruction of the dog. The realities of rescue centers can be very harsh. The reasons that the dogs end up at the springer spaniels rescue center are myriad, but in the case of the specialised breed rescue centers such as we are discussing here, then they are not usually stray dogs. This is an advantage of you are looking for such a family pet, because the rescue center will usually have some information about the dog’s background and history. In exceptional cases, they may even have pedigree papers available – a real bonus for the new adoptive owner. The absence of pedigree papers would not be a problem for most adoptive owners, unless they wanted to show the dog or breed from it. If the dog has not arrived as a consequence of, say the death of the owner, or being aged and perhaps infirm and no longer properly to exercise the springer, then the reason may be problematical. Perhaps the dog has a behavioural problem, or has proved difficult to train (unusual in the case of springer spaniels). Perhaps the dog is too boisterous for new or very young children, or even barks excessively. These are all reasons for caution if you are looking for a springer, as additional and sometimes, corrective, training may be necessary. The springer spaniels rescue center will not always know the reason that the dog has been brought in, though behavioural or barking problems would soon have become apparent. However, if the problem is thought to be one that cannot easily be trained out, then the center might have to make a tough decision about the dog’s future. Usually, if there is an obvious social problem with the dog that could be corrected, then the staff would advise prospective owners accordingly. Getting your next dog from a springer spaniels rescue center has many advantages. For example, house training will probably not be necessary, and that awkward ‘teething’ period would be in the past. However, there are disadvantages too – not least in relation to the reason for the dog being at the center. Provided that the dog is healthy (and most are), then the basic decision revolves around your family and the dog’s suitability. Often the staff at the springer spaniels rescue center will be able to help you with the decision. They want to see the dog placed in an appropriate home, and not have him or her returned to the center – dogs get disappointed too! So, that’s what it’s all about. The centers exist as temporary carers for springer spaniels whilst new homes are found for them. A simple concept, which has given many owners great new pets. If you are seriously considering springer spaniels rescue, though, then go in with your eyes open and do look at a few springers before you decide which one you will give a home to. If you do think that a springer you fancy might be the one for you, then bear in mind that extra training might be necessary. There are plenty of springer spaniel training resources available here on this site. Next Next post: Springer Spaniel Grooming – Are Dew Claws A Problem?